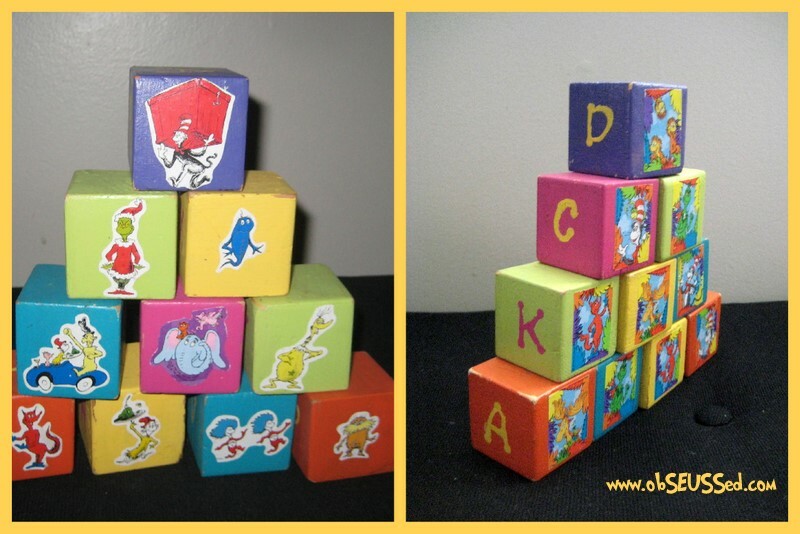 Here are some blocks I created 7 years ago for my first baby when I could not find any commercial Dr. Seuss toys online. I found some plain wood 2x2 blocks at a thrift store. Then I covered each one with a bright colored craft paint, Dr. Seuss stickers, a stencil to paint letters and Modge Podge to seal them. My kids have loved stacking them. But now they're a little older and need a challenge to keep them interested in the blocks. I just came across this inspirational craft from Mandy from the Sugar Bee Craft Edition blog. 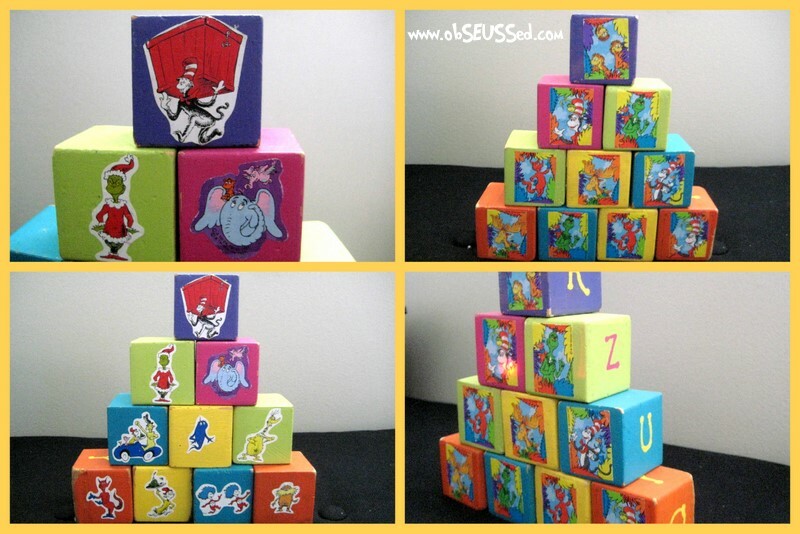 All 6 sides have a different interactive activity for your child to play with. 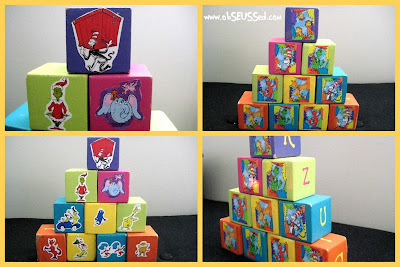 Click to see the Tutorial for these Dr. Seuss Activity Blocks. It is such a creative idea. Now I want to re-do my blocks after seeing this amazing idea. I can't wait to fix my blocks up! 1. 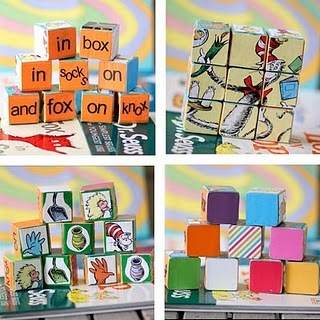 Word Game – using “fox in socks” arrange these blocks to create lots of fun and crazy rhyme sentences. 2. Puzzle – even older kids enjoy the puzzle – it can be tricky because the blocks rotate so you have to figure which way is up. 3. Look Alike - match pictures that look alike – one is odd man out. 4. Color Naming – perfect for younger kids – name colors, have them find them, let them name colors – even “rainbow” is included. 5. Counting Fish – one fish two fish – find the blocks with specific numbers of fish, group them in “less than” “greater than” and many other fun things can be done with this side. 6. Body Parts Mix-up - head-body-feet of three “things” – match them all up, or have fun mixing them up. You can see more cool Dr. Seuss Crafts, like a Grinch Advent Calendar, on So You Think You Can Craft.